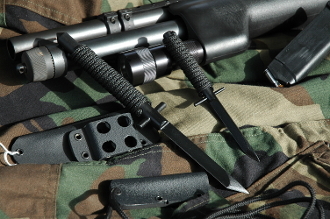 The Scorpion model was designed to be a covert carry self defense knife for law enforcement and military applications. The knife is made out of O1 tool steel, 1/2" thick heat treated to RC 60 with a black powder coat finish. The handle is 550 para-cord, multiple handle colors can be found on these knives. Double guards for a firm non slip grip. The knife can be carried in 32 different positions. It is set up for many versatile carry positions, allowing the user to carry almost any way imaginable. Including cross draw, left, right or the small of your back. You can also run your Molle straps though it or remove the belt clip all together and lace it into gear. This knife has a positive snap in the sheath! It can be carried upside down with no worries! Sheath: Black Kydex with 32 different carry positions.